I'm interested in how communication technologies change society. I write books and articles analyzing this process, create artworks critiquing it, and make objects and applications designed to change it for the good. 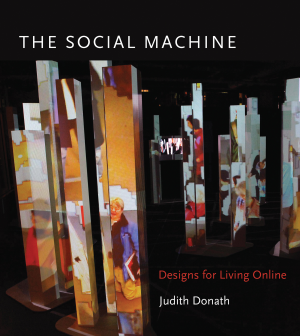 My book The Social Machine: Designs for Living Online (MIT Press, 2014) looks at how interface design shapes online identity and influences behavior. It is a manifesto for balancing transparency, engagement and innovation - and a manual for designing radically new social interfaces. Currently, I'm writing a book about technology, trust and deception. Some technologies, such as anonymous chats and easily faked profiles, make deception easier, while others, such as ubiquitous surveillance and surreptitious data tracking, promise to eliminate it. Social agents mimic empathic phrases and emotional expressions to gain our confidence and affection. In deciding whether we want to embrace or reject these technologies it is essential that we understand the economics of honesty that have shaped how we (and all living things) communicate, and the role that both honesty and deception play in helping individuals and societies flourish or fail. This book is in-progress. In the meantime, some related papers I've written include: The Robot Dog Fetches for Whom?, Signals in Social Supernets, Identity and Deception in the Virtual Community, Public Displays of Connection and a draft of a chapter about signaling theory. Since Trump's election, it has become even more crucial to understand the social dynamics of deception and the role technology plays in establishing or undermining trust. Here are a couple of short articles, on why people share fake news and how (not) to refute a lie. I've written papers and articles about many topics relating to the internet and society: privacy, reputation, artificial pets, data portraits, pseudonymity, social visualization, cute robots, anthropomorphized cars, and more. As for art and design projects, an organized listing is still to come... for now, here are some installations and exhibits. See also the Sociable Media Group's project page, for work my students did when I taught at the Media Lab.